Heat oven to 350°F. In large bowl, mix crushed crackers, cookie mix, melted butter and water. Press half of mixture in bottom of ungreased 9-inch square pan or baking dish. Sprinkle chocolate chips evenly over mixture. Top evenly with marshmallows. Cover with remaining cookie mixture, pressing to cover marshmallows as completely as possible. Bake 30 to 35 minutes or until edges are deep golden brown. Cool completely on cooling rack, about 1 hour. Cut into 3 rows by 3 rows. Rather than chocolate chips and marshmallows, this recipe can also be made with 2 king-sized candy bars and a small jar of marshmallow creme. 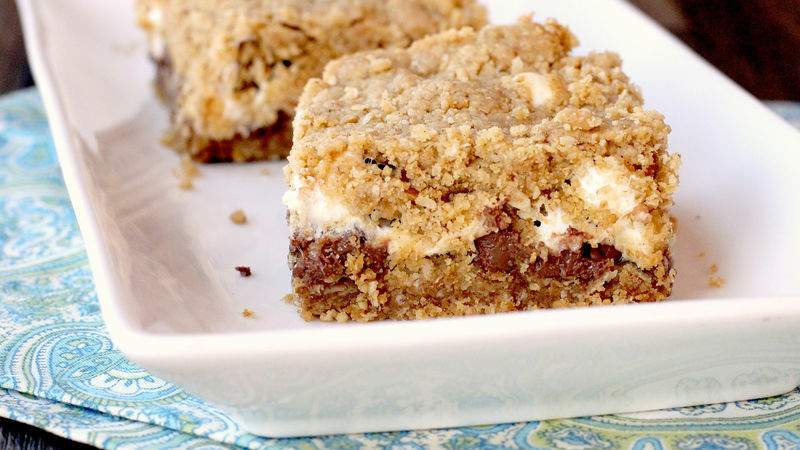 Just layer them in place of the chocolate chips and mini marshmallows and you're ready to rock and roll! Spread 1 cup of creamy peanut butter over the bottom layer of dough before sprinkling with the chocolate chips for an extra layer of flavor!